I made a log cabin quilt for my friends Pip and Dave, using up a heap of scraps I had been storing for a while. This was my first attempt at doing a real quilt, so I learned a few things on the way. The most important thing was why quilts are traditionally made from cotton fabric – the synthetic ones are so much harder so sew! 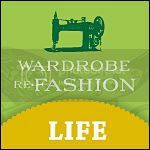 Cotton fabrics are stable and flow through the machine like they’re supposed to. The man-made fabrics, well they just have a mind of their own. 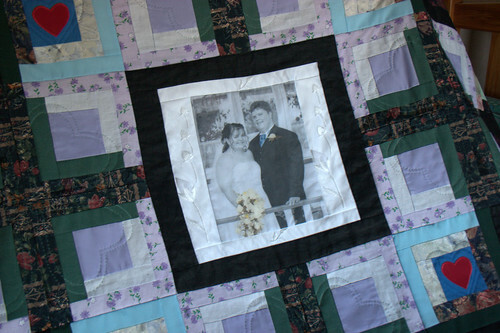 Combining them in a quilt was kind of interesting. I printed a wedding photo onto some printable cotton designed to go in your computer’s printer, to use as the centre panel and then worked a pattern around it with the log cabin blocks. The border around the photo is made from strips of Pip’s dress. I machine appliqued 4 red heart motifs to frame it. 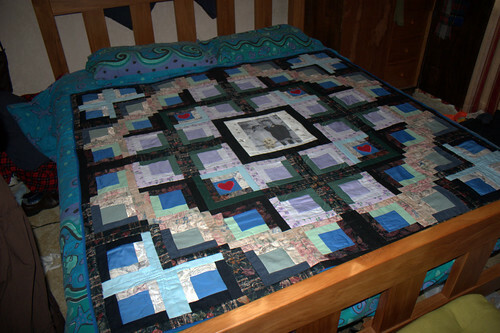 I machine quilted around the blocks for stability, and hand quilted heart motifs where there was a need. Oh yeah, Keith helped me by colouring the bouquet and Dave’s tie and buttonhole in the photo before it was printed. Ok he kind of helped with the printing part too. Thank you dear!